Home Dining Is This the Worst Coffee Shop in L.A.? They start with the rules before you walk in. Taped to the door are signs saying you must be 18 or older to enter. No outside food and drink are allowed, including water. There is no “Thanks!” No “We’re Sorry!” Zero emojis or softening language. Just black ink on white printer paper reminiscent of the signs on office refrigerators telling employees not to steal each other’s lunch. This is posted above the pastries. Even the large quote painted on the wall sounds more like a command than inspiration. Graffiti Sublime Café (180 S. La Brea) is either the worst or best coffee-shop in Los Angeles, depending on whom you ask. Some customers hate its rules, vowing never to return. Others love its ambience and drinks and are regulars. Why is Graffiti so polarizing? Because on a certain level it offers the exact opposite of the expected coffeehouse experience. White walls and white tables. Red and black chairs. A fireplace. Exposed white beams. Abstract art. A red Buddha statue with lit candles. A black baby grand piano in the middle of the room. It’s how you might imagine Tony Stark’s personal art gallery, except Stark wouldn’t have the Virgin Mary statue in the corner, unless it was being used as a decanter. Graffiti has been around since 2012. The décor gets changed up every 60 days. The coffee is good. The music is always jazz. Many of the regulars are Hollywood writers, according to a “manager” I spoke with who did not give his name but has been identified in other articles as one of the owners so OK whatever we’ll play your little game, bro. While we spoke a few people held meetings, and some guys wrote on Macs. 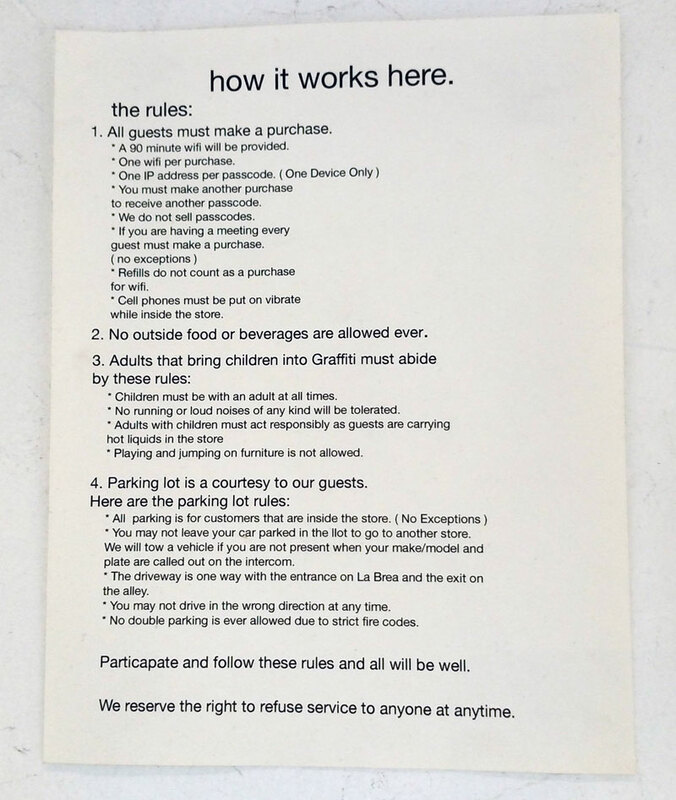 If you abide by the rules, it’s like working at any other coffeehouse. Yet it’s not like other coffeehouses. 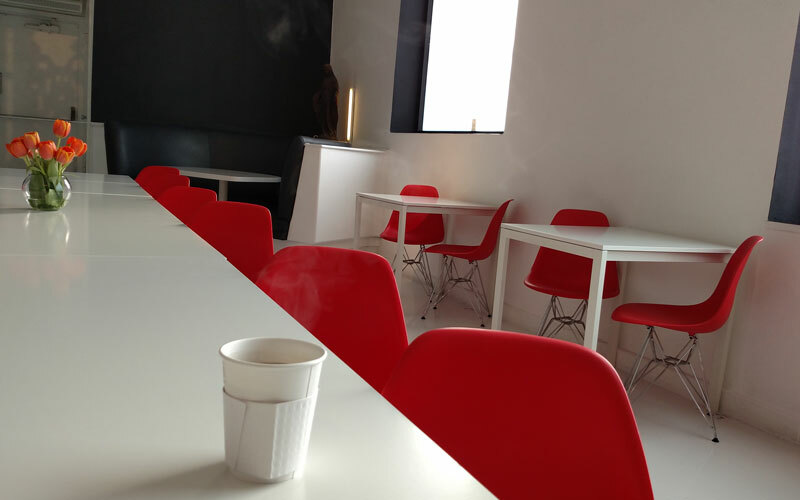 The dominance of the color red, the Clockwork Orange decor, and all those rules—all not to be found in a Starbucks, Coffee Bean, or most indie coffee shops. Those other places are done up in green, and brown, and other kinds of brown. Earth tones. Their policies are aimed at accommodating the greatest number of people. For the price of a small hot chocolate (or no hot chocolate) customers can gulp from the Wi-Fi stream and use all of the plugs and take up the whole table and let their children stalk the grounds like feral wolves for hours. Graffiti’s rules imply that the way that some customers act at coffeehouses—getting a lot in return for a little—isn’t cool. But no one says anything, because coffeehouses work to cultivate a chill vibe. When Graffiti points out that you’re using its space, electricity, and Wi-Fi, and that it expects something fair in return, it un-chills the vibe, which is upsetting because we treat coffeehouses like our homes in a way we don’t treat other businesses. Being told you can’t bring a friend into a café because they are not buying anything is like being told you can’t hang out in your own living room. It’s easy to see why some people think it’s a lousy experience. But What Do You People Want? The chief complaint about coffee culture is the dominance of Starbucks, its ubiquity, and the unceasing sameness that is, unfortunately, so often copied by its competitors. If you have been to one coffee-shop in America, you have been to most of them. Businesses such as Graffiti—or Father’s Office—do have annoying rules, but that’s one of the charming aspects of living in a metropolis. Our city is so large that its economy can accommodate a smattering of marginal or exceptional strangeness. We get “no soup for you” experiences we could never have anywhere else. 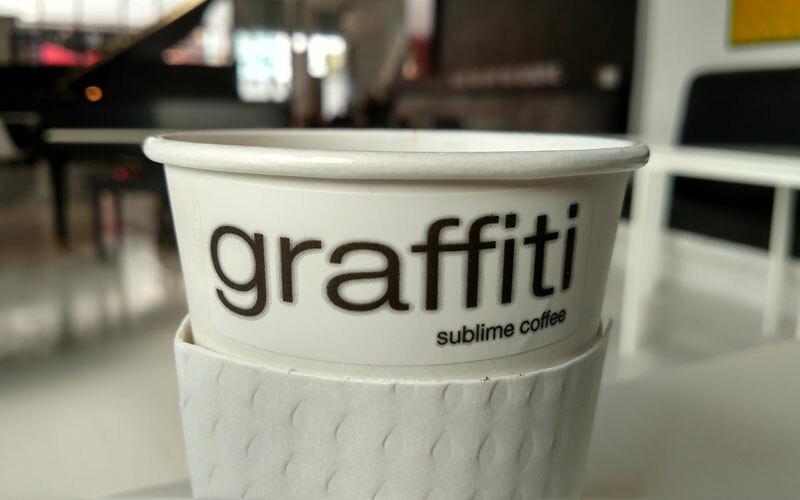 It’s a coffee-shop called Graffiti, and its exterior is simple black letters on all-white paint. It has the least amount of graffiti of anywhere in the city. Did you really think this was going to be a totally normal café? That it would not be a little odd? Don’t you want to be surprised once in a while? Along comes something different, something a little nicer, and that asks for a mutually beneficial exchange, that states its terms clearly—though maybe not always with perfect tact—but that at least does so consistently, and we freak out. No! What? This is the worst thing ever! How dare Graffiti not be more like … Starbucks!? !